On Thursday 5 December 2013, Carleton University began dismantling the nascent community garden, Kitigànensag (click here for story from the Ottawa Citizen). The community garden was occupying a place on which the university wants to erect a new residence building. The timing of the dismantling seems peculiar insofar as the Board of Governors has never in open session approved the design nor construction of a new residence on this site. Dismantling the community garden on 5 December may simply be a sign that the university administration sees approval of a new residence as a fait accompli because the Board of Governors rubber-stamps all construction projects on campus. Such preemptive action on the part of the university seems disrespectful of the Board of Governors, who is supposed to be the ultimate governing body for such financial and building decisions. I would not be allowed to say whether a backroom deal has been cut to erect a new residence building, even if I knew of such a deal. But such a hypothetical backroom deal, if it existed, would render governance by the entire Board of Governors at open sessions a sham, with representation by faculty, staff, and students becoming utterly superfluous. 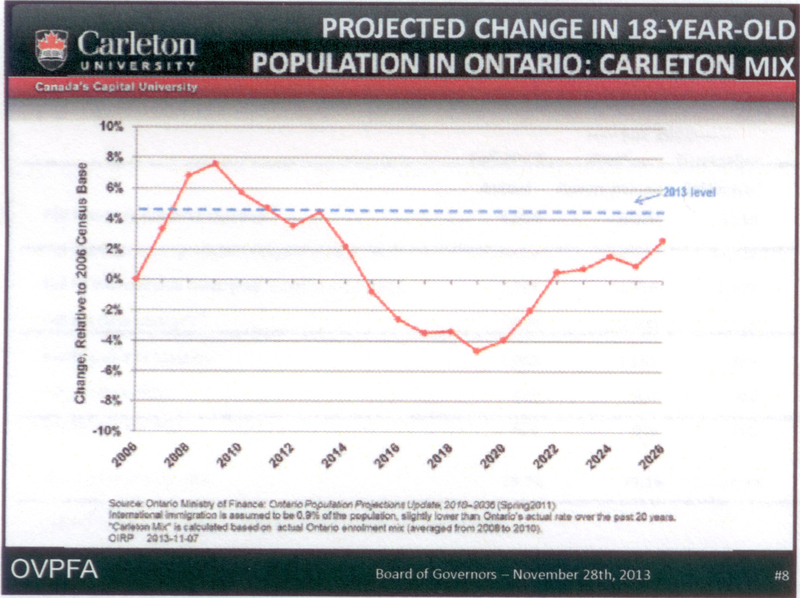 Two days ago, in this blog, I argued that Carleton’s forecasted 8% diminution in undergraduate enrolment provides a sufficient reason to not erect a new residence, especially one aimed at incoming undergraduates. If Carleton is going to construct new beds as enrolment declines, ceteris paribus, I would prefer to take the sage tack suggested by the dean of the Carleton business school earlier this week, namely to construct a hotel. That is a form of beds that exist nowhere near campus and would increase our research visibility because we could finally properly host conferences. Or what about creating dedicated graduate student housing, which might also help elevate Carleton’s research reputation. In addition to promoting sustainability, under its current president, Carleton has striven to promote community building. Destroying a community garden seems the wrong way to do that. Carleton has promised to rebuild the community garden. But the proposed site by Ox Bow Park is a nightmare. Security at the proposed new site would be deplorable. This is a dark isolated place, far away from any security cameras. The proposed new site is also filled with noxious weeds that cannot be eradicated, such as dog strangler vine, making gardening nigh impossible. Community gardens are wonderful things when done correctly and safely. They not only feed people, but teach us how to work together. They genuinely build a sense of community. They also help many of us think. I do some of my best thinking when pulling weeds. And this is non-trivial because (along with many typical Ontario garden plants), I weed a large winter-hardy cactus garden, which is a great way to keep your mind sharp, especially pulling weeds barefoot and without gloves, thereby respecting the plants and earth. I hope, but do not expect, that the community garden, Kitigànensag, will be returned to its original state in its original location. But let’s try to grow and cultivate a sense of community and ways of learning at Carleton, not simply commodify higher education. Let’s not have Carleton act like a ‘for profit business’, but instead act like a ‘social business’, much as Muhammad Yunus advocated for when Carleton awarded him an honourary degree on 3 August 2010 (click here for a link to his book).